With expert oven repair work and commitment to any job we undertake in Canoga Park, CA, we fix any oven problem fast and accurately. You can leave any problem related to your home oven, microwave, stove, and range to us. 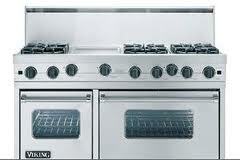 We, at Mega Appliance Repair Canoga Park, provide quick services and are experts in all household cooking appliances. Every single service truck of our company is equipped with diagnostic and regular tools for first time, efficient work. Problems are fixed with precision and new cooking appliances are installed to function with safety. That’s why you should count on us for any oven or stove repair service. Ovens & stoves together make up a range. As experts in cooking appliances and their services, we offer range repair and installation. Whether you have an electric or gas range, or problems with either your stove or oven, our technicians can help you. But we will also be there to fix any issue with your build-in oven or stovetop. Since most issues start when heating elements and other components are burned out, we always bring a variety of stove and oven parts with us. You can count on our fast response and professional oven repair in Canoga Park, California. The variety of ovens and their constant progress keeps us busy. All technicians on our team are constantly updated with innovations and thus they are skilled to fix any problem with new age cooking appliances. Ask us to help you with any problem related to your microwave. We offer fast microwave oven repair and can replace its damaged parts. Call us to cover urgently your gas oven repair requests. Do you smell gas in your kitchen? Are you under the impression that the new gas stove or oven hasn’t been installed properly? Get in touch with our team and let our technicians fix the problem. For the avoidance of such problems, we also offer oven installation and pay huge attention to the fitting of any gas appliance. Any time you need professional work, call our techs. We are here to cover any request, including urgent Canoga Park oven repair needs.